As regular readers will know, I am a long-time fan of George at Asda. So when their team contacted me to ask if I’d like to take part in a dress challenge I jumped at the chance. The challenge was to pick a dress from their current range, and add accessories etc to make it work for both night and day. I didn’t have to stick to items available at George, but I decided to do so as it’s a great opportunity for me to show you the wide range of items available on the website. 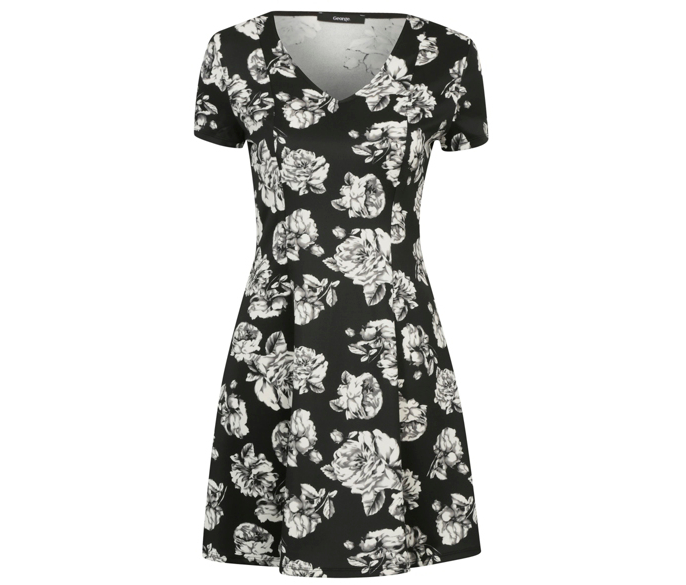 This dress is a real classic – florals will always be a winning print in my eyes and the monochrome theme of this dress is the perfect starting point that can easily be dressed up or down. And the fact it’s only £12 is incredible! I’ve used Polyvore to put together these two outfits. If you’ve not used Polyvore before then I urge you to have a go yourself, it’s so much fun! This is the first time I’ve used it myself and I found it so easy to use and it was quite addicting putting the two looks together…I wanna make MORE outfits!!! You can click on any of the items in the collages and it will take you straight to the item’s page on the George website so all of the information is at your fingertips. Pretty nifty, eh? It’s really easy to make this dress work for daytime wear. Almost any dress can be given a more casual look by adding leggings, and that’s exactly what I went for here. I wanted to choose a colour to brighten up the monochrome of the dress and I was delighted to find a range of accessories in burgundy on the George website. This was the perfect colour to complement the dress and burgundy is a perfect shade for autumn. I began with some sparkly tear drop gem earrings (£4). Yes, this is a daytime look, but as the rest of the outfit is plain I thought a little bit of bling would be just right and help brighten the look. The scarf (£6) is lovely for keeping your neck and chest warm and if it was long enough it could be wrapped around the waist like an obi belt to create definition. The cardigan (£16) is chunky and snuggly, and although it’s not my typical shaped style it would be perfect for throwing on as an extra warm layer if needed. Again, the scarf could be tied around the cardi to add a bit of shape if wished. The burgundy leggings (£6) would help keep one’s legs warm in cooler months, and the low block heel shoes (£12) are perfect for smart day wear. I would have gone for a burgundy bag if there’d been one on the George website but as there wasn’t I went for this simple black zip-through bag (£14). The total cost for this entire outfit is just £70, which is very impressive! It would be super easy to make this dress work for daytime with any colour of accessories, but personally I’d recommend adding no more than one new colour, as the dress already incorporates black, white, and grey, so anything more than one further colour would probably be too much. And now on to night time. The idea here is to make the outfit more dressy, but again I’ve got the cooler months in mind as I’m adding a few layering options. Of course, the dress could work in the summer, too, by abandoning the jacket, scarf, and tights. I have embraced the monochrome here and chosen not to add any colours besides the black, white, and grey already in the dress. Once again I’ve started with some blingy earrings (£5), and I’ve added a 7 pack of stretch bracelets (£6). This night time look is all about subtle, classy glamour, so we need some sparkle but not overkill. I was tempted to add a jewelled ring but decided against it as there’s enough shininess to this outfit already! The scarf (£6) has a shimmery effect that will look lovely under lights as it twinkles and shines. The leather-look peplum jacket (£20) is a stylish and smart cover-up option, and it’s an item that would work well as part of a number of outfits. I deliberated over choosing hold-ups instead of tights but in the end I went with the latter as it’s an autumn/winter look and these tights (£4) are designed exclusively for sizes 14+. There’s no need for shapewear as the skirt of the dress isn’t fitted so it’s a great chance to wear tights that are comfortable and not restrictive. I finished the outfit off with some black sandals (£20), which have pretty sparkly jewels across the toes. The total cost of this entire outfit is £73, which is again incredible. Well done, George at Asda, for having such a wide range of low-priced items to help us ladies keep our wardrobes filled to the brim! The post was written in association with George at Asda. All opinions and item choices are my own. Sorry I clicked publish by mistake. I wish we had George over here, I live in the US and although there are quite a few plus size brands around they are mostly pretty expensive so something like George would be perfect to bridge to gap. Oh and we want Primark also. I don't ask for much haha!! A nice dress for sure. I am coming to the UK next month so I hope it is still in the shop then as I would like to buy it. You have such a great sense of style. I love both looks, they are perfect. Have you ever considered working as a personal shopper or a stylist? I truly think you could make a career out of it as every blog post has you in fabulous clothes perfectly matched with a belt and heels. I would pay to go shopping with you for sure!!!! Can I hire you as a personal shopper? I am plus size and not confident. Love the second look and the peplum!